People affected by fibromyalgia and chronic pain know all too well the challenge of exercise. One effect of the often undiagnosed or misdiagnosed condition is that you find yourself in a state of near constant pain and fatigue. The National Fibromyalgia Association defines fibromyalgia as “a chronic pain illness characterized by widespread musculoskeletal aches, pains, and stiffness, soft tissue tenderness, general fatigue, and sleep disturbances.” Other symptoms may include irritable bowel and bladder, headaches, restless leg syndrome, cognitive difficulties, skin sensitivities, dizziness, neurological symptoms, and impaired coordination. Fibromyalgia affects up to 10 million Americans, most of them women. Identified in 1816 by a Scottish physician, it wasn’t officially recognized by the American Medical Association as an illness until 1987. It can mimic other ills, such as chronic fatigue syndrome or rheumatoid arthritis, which often leaves sufferers spending years seeking a correct diagnosis. However, nowadays we do have one diagnostic tool available if suspecting fibromyalgia. In 1990, the American College of Rheumatology created a map of 18 “tender points,” or places on the body that are most often tender to the touch in people with fibromyalgia. If a person feels pain in 11 or more of the 18 tender points, that person is regarded as a fibromyalgia sufferer. How does yoga fit into the picture? 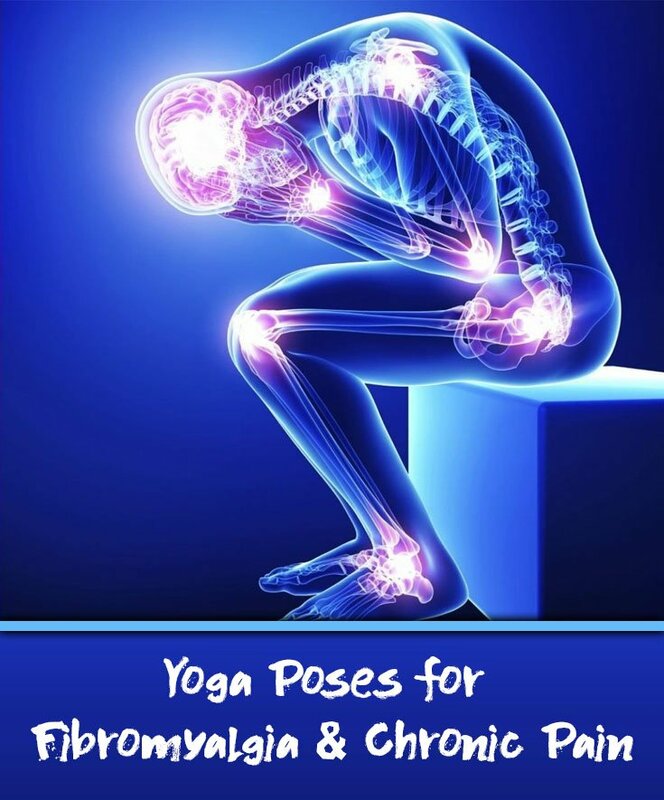 Yoga is an excellent treatment, although not a cure, for fibromyalgia. Yoga is known to calm the mind and reduce stress, which is a key trigger of this syndrome. Yoga also loosens cramped muscles and releases the tension trapped within them. The stretch in certain poses opens up the muscles near the affected tender areas. Yoga can also be adapted to each person’s needs. Child’s pose allows one to quiet the mind and senses. Because of the nature of the pose, outside stimulus is eliminated, allowing you to just focus on maintaining a proper breathing. If you’re up to it and want a bit of a stretch, you can work on slowly rounding your back or reaching your arms forward to stretch the shoulders. 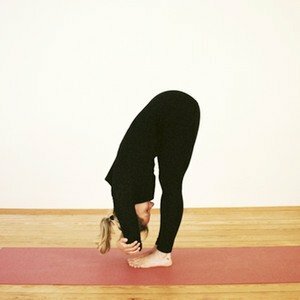 Considered the most gentle of inversions, Legs-Up-the-Wall works in the opposite direction of our typical upright posture, allowing the muscles of the hips and legs to stretch and relax. Since you are reversing the typical work of gravity on blood flow in the legs, this pose can reduce swelling and fatigue in the lower extremities. For those that find this challenging, placing a bolster or folded blanket under the hips may help. A somewhat subtle pose, the Mountain Pose may look like simply standing, but when attention is given to grounding into the earth, while drawing the shoulders down the back and lengthening the spine and breathing, you can feel your stress levels decrease. This is followed by a sense of relaxation of the muscles and organs throughout the body. This is a great posture for the further calming effect it provides as well as the opening it affords across the entire back of the body. Depending on your degree of pain and flexibility it can easily be modified, too. In the beginning you can start by placing your hands on the wall and use it as a support until you’re able to place your hands on your thighs comfortably. Cobra is helpful in opening the chest and frontal body and in strengthening and stretching the back—both of which are among the tender areas for sufferers of fibromyalgia. Make sure to ease into this pose and start by just placing your palms alongside your chest and breathing with your forehead still on the floor. From there, work your way to lifting your body as it works for you. Ideally, fibromyalgia patients want to keep muscles strong and Warrior I is a great way to do that while also calming the mind. This traditional posture strengthens the big muscles of the legs along with the back and arms. 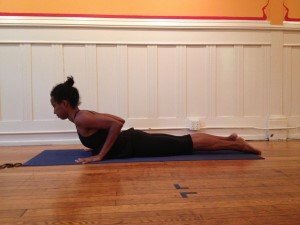 Cobbler’s Pose is great for opening the hips and strengthening the knees and groin. It will be challenging for beginners, so you can start with just your legs extended in front of you and slowly open the hips and bend the knees. Don’t forget to breathe. The more you practice it, the greater a bend you’ll be able to accomplish and the more you’ll be able to open these muscles that are likely very tight and holding a great deal of stress. 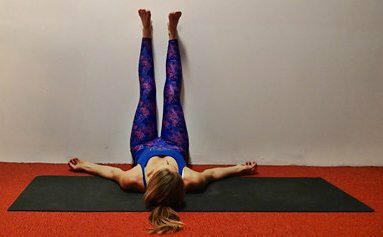 This concluding posture is done as a way to quiet the mind and relax the body. More than just lying down, in Savasana we focus on ignoring outside stimulus, accept where we are, and simply be in the moment. It also allows the muscles and organs to simply relax and return to an easy state. 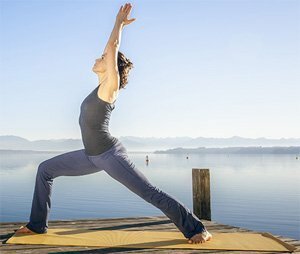 If you suffer from fibromyalgia and are new to yoga, you may want to talk to your physician before starting any exercise routine, even something gentle like this. The most important thing in each of these postures is that you listen to your body and breathe.